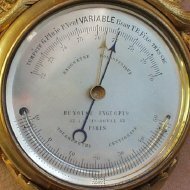 #0172 Miniature wall barometer with thermometer. 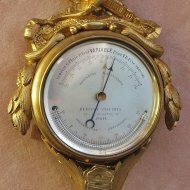 Gilded cartel with barometer and thermometer, silvered dialplate signed: 'Bunoust Ing-Opt, Palais-Royal 43, Paris'. Height 20 cm, ca. 1850-80.